KPX series battery transfer cart is a rail guided material handling cart that is powered by the battery. The battery is installed inside the equipment. This type of transfer cart provides excellent maneuverability and safety for material transporting. It can be designed with no limiting running distance, and the rail does not have to be as insulated as the KPD rail powered flat cart. The size and shape of this cart is similar to the KPD series, but it is slightly higher. The battery transfer carts are suitable for light use and long-distance transportation. They are intended to ease the flow of your workshops. However, due to the characteristics of battery power delivery, there are limited time of use, and the battery needs to be maintained regularly. The battery life is generally about 2.5 years. Deck configurations: stand-off, tilting, flat deck, V-shaped deck, custom shaped deck, etc. Two carts can be connected for transporting heavier goods or longer products. Safety equipment: warning horns, strobe lights, rail sweeps, anti-collision device, emergency stop, bumpers, etc. 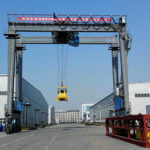 They are commonly found in machine fabrication shops, warehouses, metallurgical plants, chemical plants and other industrial plants to move goods or materials inside and outside your facility, or they can cooperate with overhead cranes to move loads between crane bays. 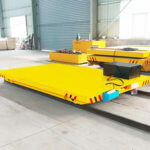 According to the type of material to be handled, the transfer car can be designed with V-frame, U-frame, rubber pad, wooden pad, weighing device, etc. For example, U type electric flat car is specifically engineered to handle cylindrical workpiece in case it is rolled and scattered. The U-frame is detachable for the ease of transportation of other workpieces. The flat cart is powered by the battery installed inside the device. It provides power to the DC traction motor through the electrical control system. The DC motor has many advantages such as stable starting, large pneumatic torque, small impact on the reducer, low voltage and long service life. 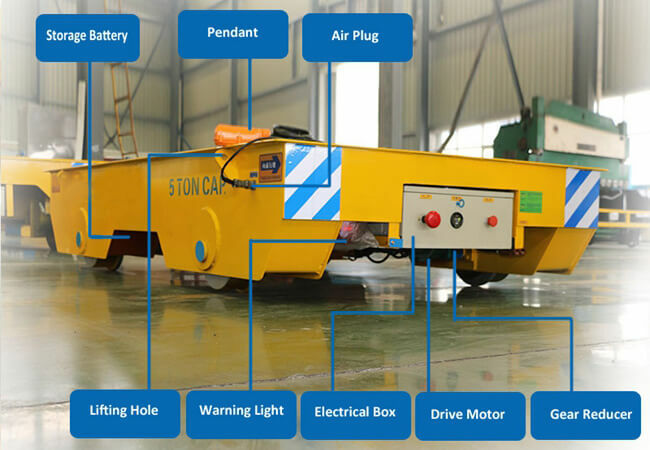 The motion of the electric rail cart can be controlled and changed by a fixed pendant or remote control. The cart can be designed to simplify control of load movement with easy-to-operate user interface systems. What’s more, the battery powered cart can be designed to travel on steel rails or it can be operated directly on the floor of your workshop. Trolley frame – box beam structure with large load capacity, long service life, non-deformable frame and deck. Cast steel wheel – it is made of ZG55 material, which provides easy installation, convenient replacement and maintenance. Battery – We use high quality battery that requires less maintenance. Intelligent charger – it provides quick charging, no damage to the battery. Anti-collision sensor – the cart can stop automatically when you touch this switch. It is designed to improve safety. Our transfer carts are reliable, durable and safe. 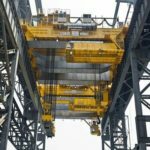 They are designed to minimize lost time waiting for material and load delivery, reduce potential damage, simplify control of the load and increase maneuverability. 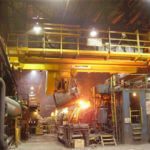 Ergonomic design enables you to reduce the use of forklifts or overhead cranes. They are available in an assortment of specifications, configurations and sizes to fit your specific application and workplace. We offer modular and flexible transport approaches to ease the flow of your facility. We provide custom solutions for your unique load transporting requirements. 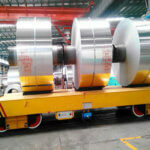 You can get the most competitive price from our company. We provide a complete after-sales service for our clients. Call us today for more information on battery transfer cart or for a free quote.